Riot police officers using their vehicles to pen in local protestors in front of Camp Schwab’s gate at 9:31 a.m. on June 2. 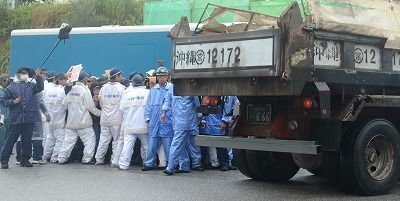 On the morning of June 2, riot police removed protestors from Camp Schwab’s gate to allow the entrance of construction vehicles for the Futenma Air Station replacement facility in Henoko, Nago. As riot police removed protestors, one man and one woman were injured and taken away in ambulances. Riot police wedged the man in between riot police vehicles and officers, ignoring his complaints of not feeling well. His pulse was weak when they released him. Around 10:00 a.m., an ambulance picked him up. According to eyewitnesses, riot police pulled the woman away and similarly penned her against their vehicles. After that, she bumped into another protester who another riot police officer had dragged over to pen in, too, and fell over. She hit the back of her head on the ground so it gashed open and bled. At 10:30 a.m. an ambulance arrived for her. 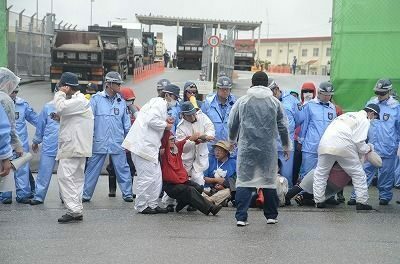 Riot policemen removing local protestors from Camp Schwab’s gate at 9:39 a.m. in Henoko, Nago. About 50 local people gathered in front of Camp Schwab’s gate in the rain, raising their voices in protest. Despite their efforts, 61 construction vehicles such as dump trucks hauling gravel and semi trucks loaded with ironmongery for scaffolding entered the gate. The first wave of riot police began removing protestors after 9:00 a.m., and at 9:15 a.m., 14 construction vehicles had entered the base. Afterward more vehicles entered in succession.